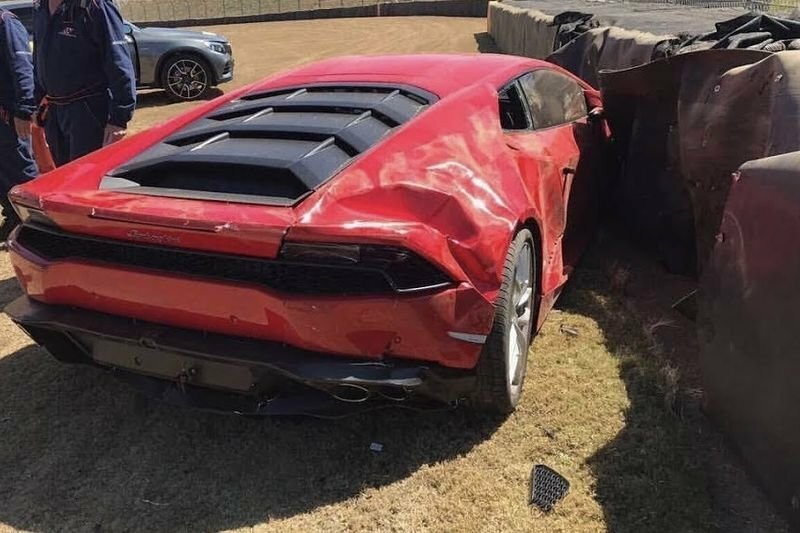 Home / Automotive / News / Video: Lamborghini Huracan Crashes At The South African Festival Of Motoring! In the video below, uploaded by Zero2Turbo, you can hear the Lamborghini's engine, see it come around the corner and then. .. BOOM! it crashes. Even though the car is barely visible before something goes terribly wrong. There is not a lot of information regarding the crash but the clip shows the Huracan speeding down a straight and overtaking a car on its right. It is a bit of a mystery but the Lamborghini appears to leave the track shortly before a corner. The car then spins out of control before crashing into the barricades. The driver was unharmed but the Huracan wasn't as lucky as the model suffered significant damage. The photo shows the driver's side bodywork is completely smashed and the rear bumper has also been damaged. While we can't see the front end, there's little doubt it will also need some work. This particular Huracan won't be driving anytime soon but the standard model has a 5.2-liter V10 engine that develops 449 kW and 413 lb-ft of torque. It enables the car to accelerate from 0-100 km/h in 3.2 seconds before hitting a top speed in excess of 325 km/h.